The duo will be performing Thursday July 17 at Oliver’s Music in the Park, 6:30 – 8:00, at the Oliver Community Stage (bandshell). Admission by donation. Bring a lawnchair or blanket or cozy up on the bleachers, Come early to catch the Market in the park from 4:30 to 8:30 every Thursday. Artisans, clothing merchants, and a whole variety of retail items and promotional displays. Food vendors also on site for your picnic supper. Excitedly, Aidan Mayes & Mandy Cole placed Top 10 in CBC`s 2014 Searchlight “Best New Artist in Canada’ Competition with their original song, “Expecting Fireworks”. After the successful release of their debut EP entitled “Hello Hercules”, produced by Dave Mai of DM Productions, Mayes and Cole also placed Top 5 for BC’s 2013 ‘Emerging Artist Contest’ by Music BC and Kelowna Radio K96-3. Recently, the songstresses received the award recognition for “Best Music” at the first annual Penticton Arts Awards. 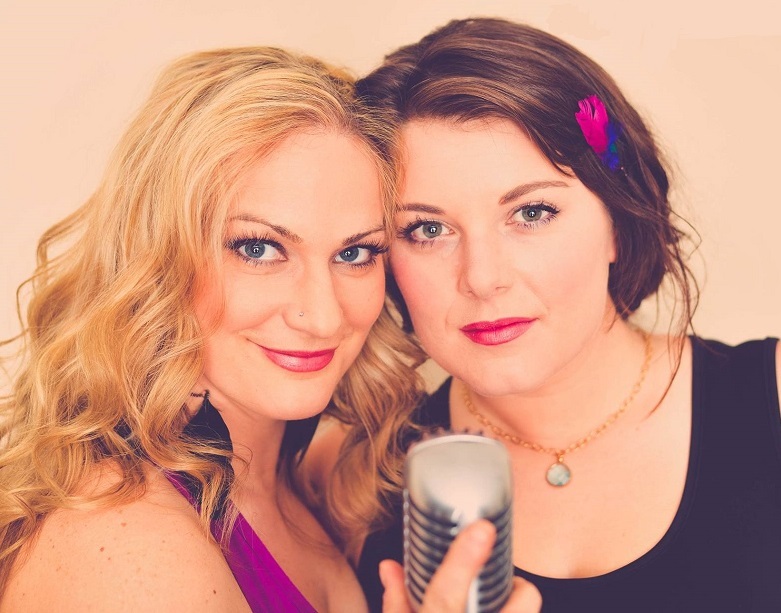 These passionate entertainers are a treat for your ears over the airways as feature artists of Peach City Radio’s, “Left of the Dial” program, “The Best of the West” podcast, CBC RadioWest and CBC Radio’s, “North By North West”. Aidan and Mandy’s music has become a summertime staple at numerous well-known Okanagan locales including ‘The Sunshine Cabaret’, ‘The Sunshine Festival’, ‘Peach Festival’, ‘The Granfondo Axel Merckx’, ‘Therapy Vineyards’, ‘Hester Creek Winery’ and the renowned ‘Dream Cafe’, as well as weddings and special events. Both artists feel blessed to teach music full-time during the fall and winter months. Aidan teaches voice, guitar, song writing and musical theatre at The Maeve Lily School of Music, while Mandy educates with School District 67, passing along their love of music to the next generation of young artists.